Arsenal are set to wear their blue change strip at home to FK Östersunds in the Europa League tonight, as the Swedish club’s first and second choices would clash with the Gunners’ red and white and the visitors don’t have a third kit (thanks to Andy Kelly for alerting us to this). It’s far from the first time this has happened – in fact, it was only last season that a similar situation saw Arsenal wear yellow against Basel at the Emirates Stadium in the Champions League. It used to be the case that, when a colour-clash occurred in the FA Cup, both teams would change kits. Researching all of those instances is beyond us but The Arsenal Shirt may have some interesting info in that regard. When European competitions began and communications methods weren’t as advanced as now, the rule was that the hosts changed, and that’s what happened when Arsenal met Ajax in the 1969-70 Fairs Cup semi-finals – though a year later in the European Cup, Ajax would wear white shirts and blue shorts as they knocked Arsenal out at Highbury. Just over 29 years ago, on Valentine’s Day 1989, Arsenal took on France in a friendly at Highbury as France manager Michel Platini wanted a ‘British’ challenge before taking on Scotland in a World Cup qualifier. The shirts didn’t clash, but both sides had white shorts and red socks and so Arsenal switched as they won 2-0 – Scotland would also win by the same scoreline and France missed out on World Cup qualfication. In 1991, UEFA reintroduced the rule that home teams should change, and so it was that the ‘bruised banana’ was used in beating Austria Vienna 6-1 at Highbury (and also against Benfica in the next round as the Portuguese side advanced). The imposition of the rule was inconsistent, for instance when Arsenal met Standard Liege in the 1993-94 Cup Winners’ Cup the away teams changed, but the home sides did in the tie against Torino. Having won that competition, Arsenal met AC Milan in the 1994-95 European Supercup, and wore their new Nike navy away in a scoreless draw at Highbury before Milan wore yellow as they won the return leg 2-0. Incidentally, in 2011-12, a similarly coloured Arsenal away wasn’t allowed to be worn in the San Siro, with yellow worn instead. In 1998-99, Arsenal found themselves in the same situation as Östersunds now, in that their red home kit and yellow away clashed with Lens, who had changed to black for their home game. Clearly, UEFA’s rules were different then as Arsenal had to knock up an emergency third, with logos applied to a teamwear template. Despite the 1-0 loss at Wembley which eliminated Arsenal, the one-off shirt remains popular with collectors. 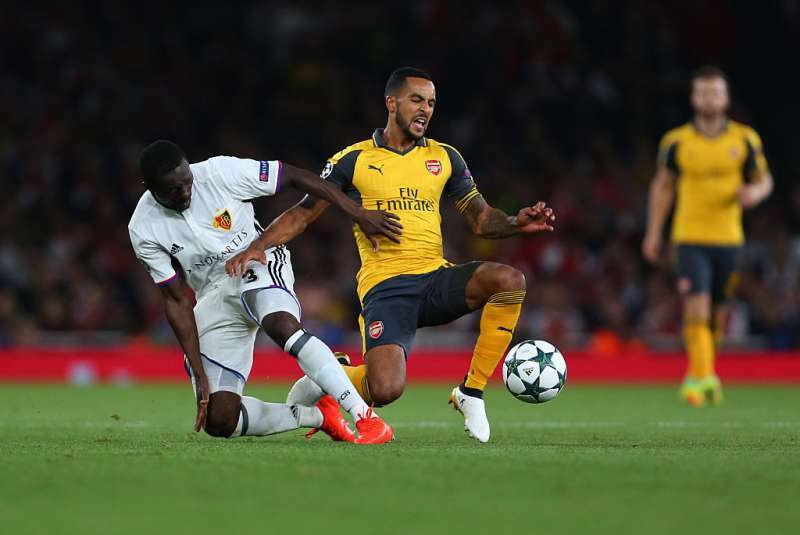 The following season, Arsenal were again knocked out of the Champions League early, though on this occasion they had the safety-net of the UEFA Cup, where they met Lens again, with the home teams changing once more. This time around, Lens’ main kit was more red-heavy, so Arsenal wore their yellow away, but as this report mentions, the French side’s yellow shorts were still problematic and Arsenal sought to change at half-time (to white, according to the report). That request wasn’t allowed, but such an occurrence did happen in the following season’s Champions League. Having launched a new navy third shirt, Arsenal showcased it in a home game against Sparta Prague, but the dark maroon of the Czech side’s kit caused a clash and this time Arsenal did change at the break. The away shirts were called upon there was far more contrast. Incidentally, the only other time that this kit was worn with yellow socks was in the 6-1 mauling at Old Trafford in early 2001. In that 2000-01 Champions League, Arsenal progressed to the last 16, which was then a second group phase. While the away teams would change in the Arsenal-Spartak Moscow games, it was the opposite when the Gunners met Bayern Munich. At Highbury, Arsenal started brilliantly to go 2-0 up but Bayern – in their European kit, a lovely homage to the outfits worn as they won three in a row in the 1970s – came back to draw 2-2 and ultimately topped the group, going on to win the competition. And that was it, until last season, at least for official home games. In 2002-03, Arsenal were drawn with Farnborough Town in the FA Cup, with a request by Farnborough to switch the game to Highbury granted (the rules have since changed, preventing such alterations). Arsenal used the away dressing room at Highbury and turned out in their blue kit, but it didn’t stop them from winning 5-1. Fifteen years later, they are once again wearing blue on their home ground in a competitive game.